Want to teach preschoolers the letters of the alphabet? 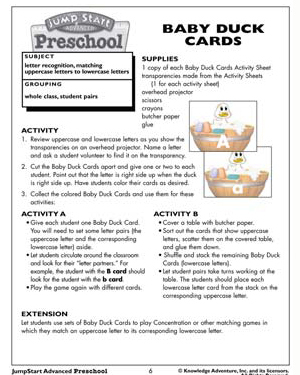 Use our printable English activity, ‘Baby Duck Cards’! With cute cards that display each uppercase and lowercase letter, this fun activity for preschoolers will make learning the letters an enjoyable process. Free preschool activities like these are a useful resource for parents and teachers who are looking for innovative and interesting ways to teach the tiny tots!